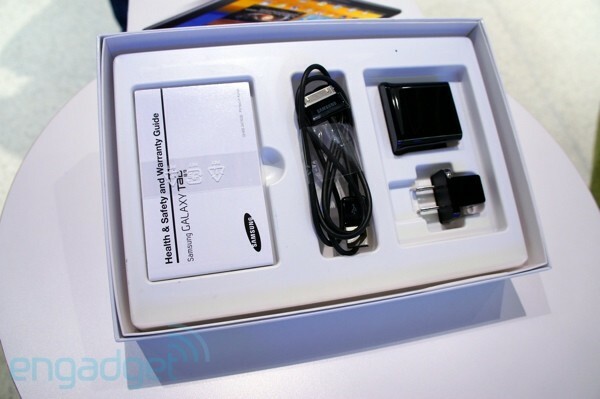 How would you rate the Galaxy Tab 8.9? If you're familiar with the Gal Tab 10.1 you'll find the slightly svelter 8.9 a particularly comfortable beast. Where many companies are struggling to find a corporate image and common style to apply to all their devices, Samsung here had no problem simply shrinking down the elder tablet's overall design by about 12 percent. It's only when they're side-by-side that you can see a few subtle differences -- most notable being the repositioning of the speakers from the sides to the bottom where they now flank Samsung's proprietary connector. The 8.9 uses a plastic backing with a faux brushed metal texture. It matches what's currently applied to the 10.1's rear end and definitely has a nicer feel than the smooth plastic we got on some of the earlier 10-inchers. 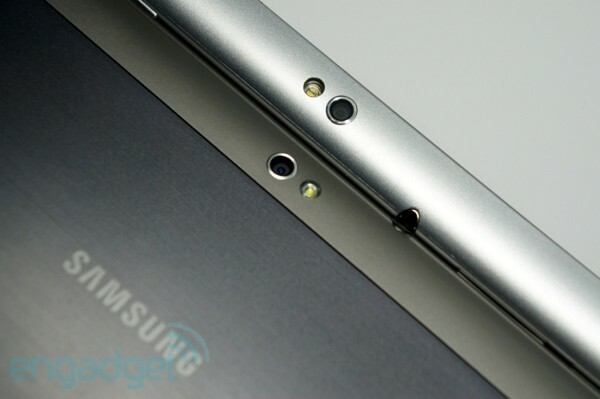 It's given a dark, bluish hue Samsung calls Metallic Gray, though we're not seeing much in the way metal flake. With that as your only color choice your only options for customization lie on the capacity front: 16 or 32GB, neither of which can be expanded through microSD. Dimensionally the 8.9 is only slightly smaller than its big brother. It measures 9.1 x 6.2 x .34 inches and weighs in at .99 pounds (230.9 x 157.8 x 8.6mm and 447g, if those are your units of choice). That compares to 10.1 x 6.9 x 0.34 inches and 1.24 pounds, making it only moderately more svelte and a hair less heavy. (Our calipers measured it as being thinner, too, but only by a few fractions of a millimeter.) 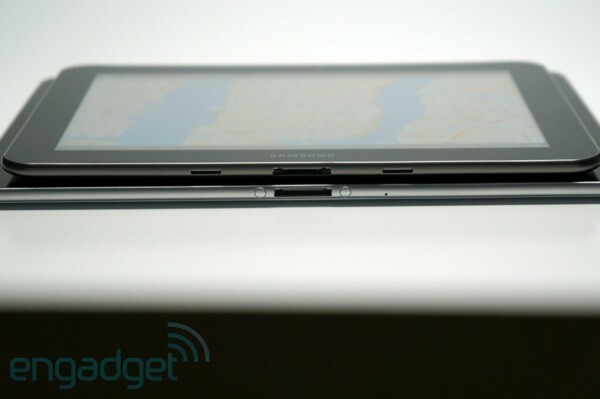 This compares favorably to another 8-inch option, the Archos 80 G9, which is 3mm thicker and 18g heftier. That difference between this and the 10.1 doesn't sound like much on paper, and if you stack them up it doesn't look like much either. But, in the hand, you notice it. It just feels slightly more balanced, slightly more palmable than the bigger one. It isn't as nice to walk around with as a 7-inch tablet -- still our favorite size for tableting while strolling between gates at the airport -- but it is a noticeable improvement in the hand compared to the 10.1. Though smaller, the 8.9 still packs 1,280 x 800 pixels in its 16:9 PLS TFT LCD, so you're giving up size but gaining pixel density. You are, however, gaining both compared to the 8-inch Archos 80 G9, which makes do with just 1,024 x 768. The three megapixel camera around the back and two megapixel unit up front appear to be the same as the one that came before, while the power button and volume rocker are positioned in their familiar locations -- the upper-left. That 8.9-inch display impresses, not with the stunning contrast of Samsung's Super AMOLED Plus displays but still managing to look quite good. As mentioned above the pixel density is slightly higher than on the 10.1, which does give text and other high-contrast shapes a slightly smoother appearance. Viewing angles are good and, overall, this is definitely a top-notch panel in here. Still, we have to wonder why Samsung stuck this with a TFT screen while reserving its especially stunning Super AMOLED Plus display for that mythical no-show, the Galaxy Tab 7.7. The 8.9 features the same 1GHz dual-core processor and 1GB of RAM as its 10.1 inch predecessor, so no surprise, then, that performance here is similar to what we saw on the 10.1 -- though not necessarily identical. Quadrant gave us an average of 2,341, which is surprisingly higher than the 1,800 or so the 10.1 puts down. Linpack Single 26.846, though Linpack Multi wouldn't give us consistent enough scores to warrant inclusion, and Neocore also refused to cooperate. Nenamark netted 38.1, Nenamark2 18.1 and Sunspider clocked in at 2,295, just a tick slower than the 10.1's 2,200. It boots from cold in 35 seconds. Real-world impressions back up the benchmark findings. The 8.9 feels exactly the same to use as the 10.1. In back-to-back testing of the two occasionally the 10.1 would load an app slightly more quickly, sometimes the 8.9, but neither had a conclusive advantage over the other. Unless you had them both sitting side-by-side you'd never tell any difference, and even when we did we had to be really paying attention. When it comes to longevity the 8.9 does not disappoint -- though it doesn't quite live up to its predecessor. The 10.1 (with a 7,000mAh battery) scored a very impressive 9:55 on our intensive video rundown test, almost matching the 10:26 of the iPad 2. The 8.9, with its 6,100mAh battery, managed 9:21. That's well more than the seven hours managed by the Archos, and plenty enough for all but the most punishing of flights. Not to sound like a broken record, but the camera assemblies here appear to be identical to what we saw on the 10.1 -- that is to say, it takes acceptable shots, but you won't be retiring your DSLR. Nor your compact, for that matter. See for yourself in the pics below. 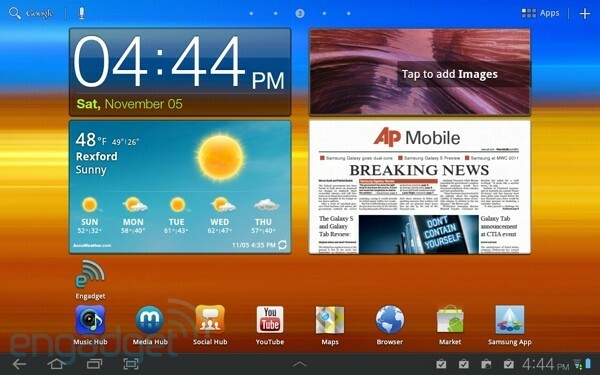 The Galaxy Tab 8.9 runs Honeycomb 3.1, featuring the same TouchWiz customizations found on the bigger 10.1. We already detailed them quite comprehensively before, so we won't waste too much time doing so here again. But, we will say that the additions to the OS here are generally welcome, and the easy to access utilities for taking notes and calendar make this a rather more useful machine than it might be otherwise. Beyond that, the Honeycomb build here has the same quirks as any other build of Google's OS. It's still something of a mixed bag of an OS that we find occasionally clunky and unintuitive to navigate, but again that hasn't changed significantly since before -- and it won't change until these devices are updated to Ice Cream Sandwich. When will that happen? Samsung isn't saying. There aren't a huge number of contenders in this, the greater-than-seven-but-smaller-than-nine-inch department. Currently it's really this or the Archos 80 G9, which has a .9-inch smaller screen, a lower resolution, worse battery life and a chunkier construction. But, it is considerably cheaper ($300 for 8GB, $320 for 16GB) and seems to offer slightly improved performance. The strongest competition, though, comes in at 1.9-inches smaller -- in the form of the $430 T-Mobile Springboard (which offers shorter battery life but a nicer display), the $400 Galaxy Tab 7.0 Plus, or the compellingly cheap Kindle Fire and Nook Tablet. We'll have full reviews of those last two soon but, at just $200, Amazon's offering is going to be tough to beat. 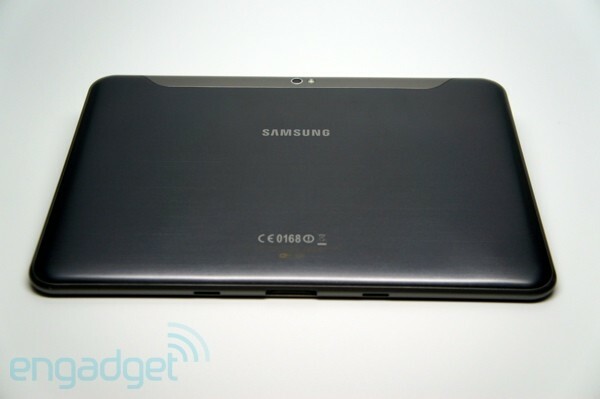 Samsung halts Galaxy Tab 10.1 TouchWiz UX updates to prevent bricking issues? 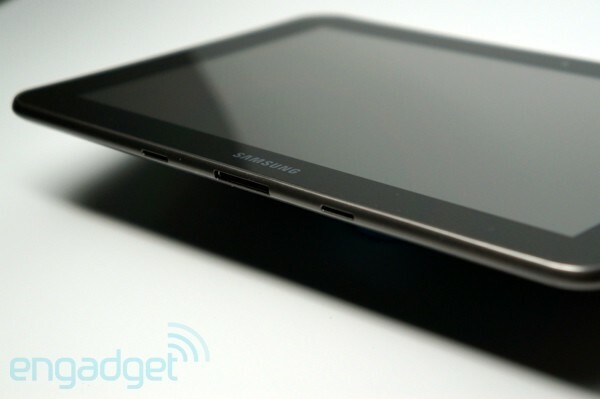 The Galaxy Tab 8.9 exists in a gadget niche so small we weren't convinced it needed to exist. Despite that, the thing fills it admirably well. Given the choice between taking along this guy or its bigger sibling we'd almost universally take the 8.9. The loss in screen size is barely noticeable since the resolution is kept the same but the difference in handheld usability is tangible. That said, those of you buying a tablet exclusively for couch surfing would likely be a bit more comfortable with the slightly larger display. Whichever you choose, cost won't be much of a factor. The 16GB version here is $449 and 32GB $549. Each is just $50 less than its 10.1-inch counterpart. Is a 10 percent price reduction fair for a 10 percent size reduction? Ultimately that decision lies with you.